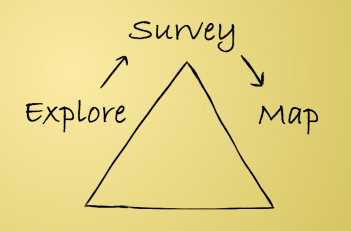 Vantage Point Wealth Advisors uses a distinctive three-step process when working with clients: Explore, Survey, Map. The first phase of Vantage Point's process is focused on learning about you. Our Financial Navigators will meet with you to understand your hopes, dreams, and aspirations, in addition to data about your current financial situation. By looking beyond the numbers and working to know you as a person, we can develop a plan that is unique and specific to your individual needs. Once we have learned who you are, our Navigators begin the process of helping you to survey your personal financial landscape. We will create a financial plan that addresses issues related to retirement, education, estate planning, insurance, investments, and any other special circumstances you face in life. In the final step of our process, we present our findings to you, and make any adjustments necessary to ensure the overall effectiveness of your financial plan. We will then assist you in the implementation of your plan, taking you through each step one-on-one. Through an ongoing consultation process, we are able to keep updated on any changes that occur in your life so that you can rest assured that your plan reflects your current situation.